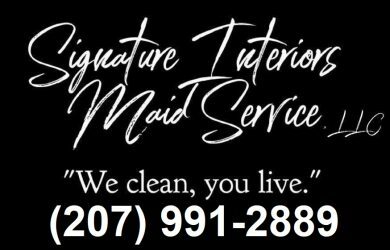 Signature Interiors Maid Service LLC | We Clean. You Live. “We clean, you live.” It’s not just our motto, it’s our mission. Professional house cleaning services in Bangor, Brewer, Hampden, Holden, Hermon and surrounding areas. Our maids are fully trained and offer consistent and reliable home cleaning that’s convenient and affordable. Our thorough cleaning system ensures every house is cleaned to perfection, every time. Our managers inspect every service before we leave a home to double check our clients needs and our very high standards are always met. We offer a variety of services, from one-time Spring/Fall cleanings to weekly, bi-weekly, and monthly visits to keep your home looking and feeling great. We also have add-on services to customize your home cleaning to exactly fit your needs. Our maids are given a thorough background check and must pass a detailed training program before they are able to clean your home. 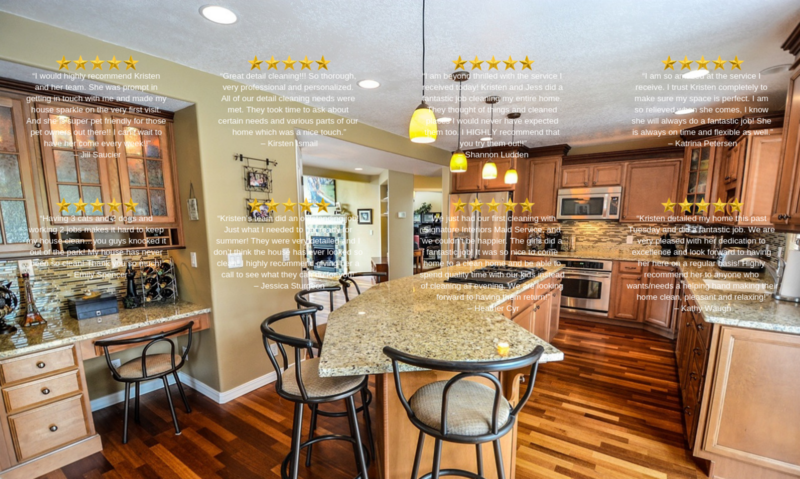 This results in some of the hardest working, most detail-oriented home cleaners in Maine. They are the best around and we are immensely proud of them! Text Kristen at (207) 991-2889 and setup a FREE ESTIMATE today, or message us on our Facebook page! “It looks and smells great! Your team did an excellent job! “Kristin and her team went above and beyond!!! I’m in my third trimester and not ashamed to admit it but as a single parent with two companies have no time to clean. After a couple of months of build up I started looking and found Kristen. I wouldn’t say her company cleaned…. they DETAILED my apartment. Furniture moved, corners spotless!!!! “On a friend’s trusted advise… We called for assistance in Spring cleaning! OMG! These girls ROCKED it! Plus they dealt very well with one barking fur kid and the other leaky (peeing) fur kid! My house is a HOME now! (And I’m an OCDer). Totally H A P P Y ! You Peeps Rocked! I especially like that the job is inspected before finalized! “Love this service! They are the best, conscientious, hard working, and always pleasant. Can’t ask for more! You have a life, and our goal is to keep your home or office cleaned, organized, decluttered, and streamlined so you can get busy living! Signature Interiors Maid Service was 7 years in the making. Owner Kristen Hornbrook has been passionate about helping others achieve their best life since early in 2003 when she joined her first MLM company and started on the path to personal growth. Through the years Kristen has learned many tips, successful strategies, and ideas which she has put to use in her own home and office and many of her friend’s as well. Now, 14 years and lots of experience later, Kristen created Signature Interiors Maid Service to fill a huge need in the area and also to use her life-long talents and attention to detail for the benefit of the good people of the Greater Bangor area. Signature Interiors Maid Service is not your average home/office cleaning company, no! Just like every signature is unique to the individual, so is every customer and every job we take on here at “SIMS.” No two people have the same home, office, or living space and no two people have the same ideas of how their space should look and feel. Home and office spaces are as individual as the person who occupies them and we take all of this into consideration when we create a detailed Signature experience for each client. Prior to our first visit to the space to be cleaned we have our clients and potential clients fill out a questionnaire which lets them share every unique aspect of their needs as well as what their expectations are and what they want the ultimate outcome to look like. We do our very best to make sure our client’s expectations are met at every step in the journey. Because we know that your family’s health, your pet’s health, and the environment are important to our customers we offer cleaning services which utilize the safest and most effective products on the market today. We treat your home as if it were ours! We believe that every client deserves a dependable, on-time, honest, hard-working, dedicated, reliable, and trustworthy home/office cleaner. And that is exactly what we offer at Signature Interiors Maid Service. We offer a wide variety of services for our client’s home or office space. Please visit our ‘Services’ page to see all the services we provide our clients.